This is our Fozen 4-in-1 combination. 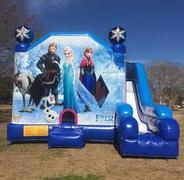 This unit features a large bounce area, pop-up obstacles, basketball goal and slide. In person, this combination is beautiful!! !